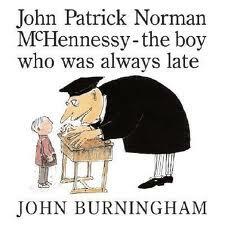 The premise of this book is a simple one: John Patrick Norman McHennessy is often very late for school and his teacher never ever believes the reasons (dramatic as they are) that explain his tardiness. The teacher gets quite distraught – shouting, becoming red in the face, leaping about as he doles out ridiculous punishments. Standing in the corner. Writing out lines. 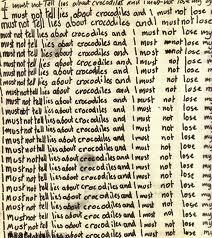 Repeating “I must not tell lies about. . . ” On and on. Finally, when John Patrick manages to arrive on time, his teacher is being held up on the roof by a big hairy gorilla. Hmm . . . I must not . . . .
Lines, lines and more lines. This must be the answer for deceptive little boys with overactive imaginations! What I love about this book is that it is not actually simple at all. What a delightful boy to come to school each day with stories of trouser tearing lions, sweep you off your feet tidal waves and crocodiles who play tug of war with your school satchel. And yet, he is punished day after day after day. 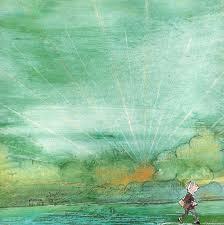 But, each morning he gets up and sets off on the road to learn. What exactly is he learning, one might ask? On the road to learn. . . I look forward to third term in the classroom. Celebrating imaginations. Inspiring ideas. Thinking outside of the box! Off along the road to learn! This entry was posted in Picture Book Love and tagged fiction, great read alouds, John Burningham, picture books by carriegelson. Bookmark the permalink.